Which dog food do I recommend? The Dog Foo d Advisor “highly recommends” Nature’s Domain Grain-free Puppy Food (from Costco) with a 4.5 of 5 star rating. And we also add Nature’s Domain canned food, which has a 5 star rating- you can read the review here. Don’t be misled by name brands or automatically equate “expensive” with “high quality.” I strongly recommend checking the reviews for any dog food you are considering- even prescription food from your vet. As a breeder, I have received multiple calls from dog food companies who have browsed my website requesting me to be a vendor for their dog food. They tell me I can “make money every month from every new owner who purchases their food.” I tell them I would never promote an average quality, expensive dog food over Kirkland’s above-average quality, economical dog food. One reason I am putting this information on my website is to deter dog food companies from contacting me. Beware of breeders promoting online-order dog foods to receive commissions from your purchases. They tie a “nutritional program” to the health guarantee, requiring you to feed a particular food or the guarantee is void. Often, the dog food they promote isn’t even the food they would feed their dogs! Bichons enjoy many foods as a nutritious addition to their everyday kibble. My bichons love to munch fresh carrots each morning. Their daily vitamin is a tasty treat- I use Doc Roys Daily Care Canine from Revival Animal Health. You can find them here . I have compared the ingredients in these vitamins to several other brands and these come out on top. Plus, my Bichons love them!! Other tasty additions are fresh eggs from our chickens, organic sweet potatoes from our garden, crunchy apple slices, rotisserie chicken, and other cooked meats. I also supplement with salmon or fish oil rich in Omega 3. For use in training I use grain-free dog treats. Bichons are a beautiful breed with a soft, luxuriant coat. 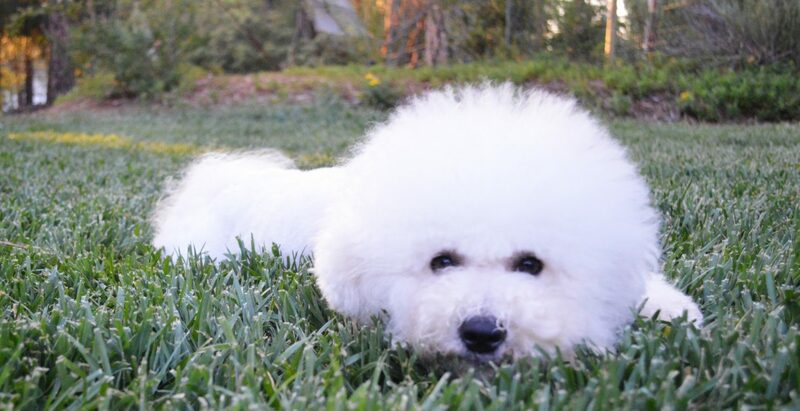 Anyone who has owned a Bichon will agree that keeping them looking their best can be a challenge. This is why I compiled a list of the grooming tools I use for my new puppy owners. I want your grooming experience with your Bichon to be manageable and pleasurable from the start. Having the proper tools will determine whether your grooming time with your Bichon is enjoyable or frustrating. Although many quality grooming products are available, the market is also abundant in sub-par products. These tools and supplies are tried and true as effective and durable. I have even listed ordering information to make it as simple as possible for you. Puppy Food– Your puppy has been eating Kirkland Premium Puppy food (available at Costco) soaked for at least 30 minutes- 1/4 cup puppy food with 1/2 cup water. I also add a spoonful of cottage cheese to aid in digestion, but this is optional. Your puppy pack includes enough food for your puppy for several days. You may use this food to transition your puppy to a puppy food of your choice. General Information– To learn more about caring for your Bichon puppy I recommend Bichon Frise (Barron’s Dog Bibles) by Richard Beauchamp – $13 on Amazon. *About PetEdge- PetEdge is actually a warehouse in Reno that supplies to retail pet supply stores. They offer wholesale prices. They charge a $6.99 processing fee for orders less than $60. Also, they have a flat-rate shipping charge of $5.99 for orders over $150.